Thanks to the support we received from our friends, MAX BioPharma was able to conduct a study to explore the effects of oxysterol on hair growth in a very humane mouse model. Our observations from this study are significant and crucial in our ability to decide what additional studies will be needed to further pursue the use of oxysterols in hair growth indications. We hope to have future observations to share about this topic in the near future. Cheers. It is estimated that 40 million Americans suffer from hair loss. * Most hair loss is actually caused by a lack of hair regrowth rather than the increased shedding of hair. Available treatment options typically work far better to prevent further hair loss than to regrow lost hair. This project will address the question whether Oxy133 can safely stimulate hair stem cells in mice and trigger increased hair regrowth. In principle, this application could translate into a hair growth treatment for humans, as Hedgehog signaling functions similarly across species. * Successful experimental outcomes would then allow us to partner with pharmaceutical and cosmetic companies, as well as investors, to further develop the drug and advance to human testing and eventual commercialization. The immediate goal of the project is to test the ability of Oxy133, a sterol based activator of Hedgehog signaling, to enhance hair growth in mice through topical application of the compound, a simple but effective model of hair regrowth. We believe that Oxy133 is highly suited for dermatological applications due its high solubility in skin oil. If successful, this pilot study will provide data that can be presented to potential industry partners and investors who will help us develop the technology for commercialization. The long term goal of this project is to offer a new, safe and effective treatment option to people suffering from hair loss. There are standard costs that go along with animal experimentation. $5,000 would cover all costs from creating more of the drug candidate for use, housing the mice, paying the scientists, applying the drug, recording the results, and maintaining the lab. The project is important as it will teach us about the effects of Oxy133, an oxysterol, on hair growth in mice, a crucial first step in finding a new treatment for hair loss in people. As the Director of Molecular & Cellular Biology at MAX Biopharma, I enthusiastically endorse this project. The study will take about 2 months from start to finish. Mice will be purchased from commercial vendors, we will shave their backs and apply the drug candidate daily at two doses for 3 weeks to observe and document hair growth patterns. At the end of the study, if hair regrowth is enhanced with our drug candidate, as we anticipate, we will carry out histological examination of the skin and hair follicles. At MAX BioPharma, we aim to realize the therapeutic potential of a previously understudied group of lipid molecules, so-called oxysterols, and understand their role in human health and disease. Leveraging combined expertise in the fields of cellular biology, lipid biochemistry and drug discovery, we work to build a new generation of therapeutic agents that can address a number of unmet medical needs. 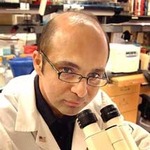 Dr. Farhad Parhami worked at UCLA as a biomedical researcher and Professor of Medicine for over 22 years. 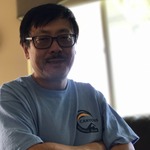 While at UCLA, Farhad first studied the effects of certain sterols, including cholesterol and oxidation products of cholesterol, so called oxysterols, on the cellular signaling of adult stem cells. Remnants from our prenatal period, adult stem cells can be found in all human tissues and are crucial elements for our body’s normal maintenance as well as repair and recovery from injury or disease. For example, skin injuries, such as cuts or bruises, are repaired with help from skin progenitor cells, so called fibroblasts, which become activated during wound healing. Similarly, broken bones heal by drawing in bone progenitor cells that reside in the bone marrow and turn into mature bone cells, so called osteoblasts, near the site of bone injury. Farhad’s research demonstrated that adult stem cells can be activated by oxysterols without affecting other cells that are not stem cells. That is because oxysterols work by stimulating stem cell specific signals, such as Hedgehog signaling, in a safe manner that does not lead to overstimulation, which can be potentially dangerous. This so called “allosteric” activation amplifies only preexisting Hedgehog signals found in the adult stems cells.